Here are the prints. The color isn’t too good. Dad said if I was going to take prints I should have used the correct kind of negatives. He has gone to a Staff meeting tonight at the Health Center. When he comes home we are going to put the old carpet which was on the original living room floor, on the back bedroom floor. We started the process Monday night, but last night as you know we went to the game. Edna is working at Credit Dept. of St. Elizabeth Hospital. She has an apartment across the street from St. Boniface Church at 9th & North. I picked her up after work Monday and brought her out here. We had dinner and after we had watched some TV we took her home and Dad got to see her apartment. It is not as nice as the one she had in Kentland, but is within walking distance of the Hospital. She doesn’t like it too well, but had to take what she could get for the time being. I am going to take her to a lecture at Loebs Theatre tomorrow evening. Dad has the duty and thinks he should not try to go. I think he could, but the telephone set-up there isn’t the same as at the Music Hall. Harrison Sallisbury of the Wall Street Journal is going to talk about China. Purdue is having a China series this month and next and I am endeavoring to take in everything. We have seen one film and heard one lecture so far. I invited the McClures to come for dinner tomorrow night and go with us, but haven’t heard from them. Did I tell you we have the office rented. A Doctor Imperial (Philipino) is renting it temporarily. We don’t know how long he will want it. The Bank and investors are supposed to build a Clinic in Kentland for Dr. Imperial and I suppose Dr. Kresler and when that is finished our building will be for sale again. It continues to be cold here, but one more week and we will be in March, so spring should be not too far away (famous last words). P.S. Have the baby sweater well on way. About to finish fronts, then make sleeves, and presto! It is finished. 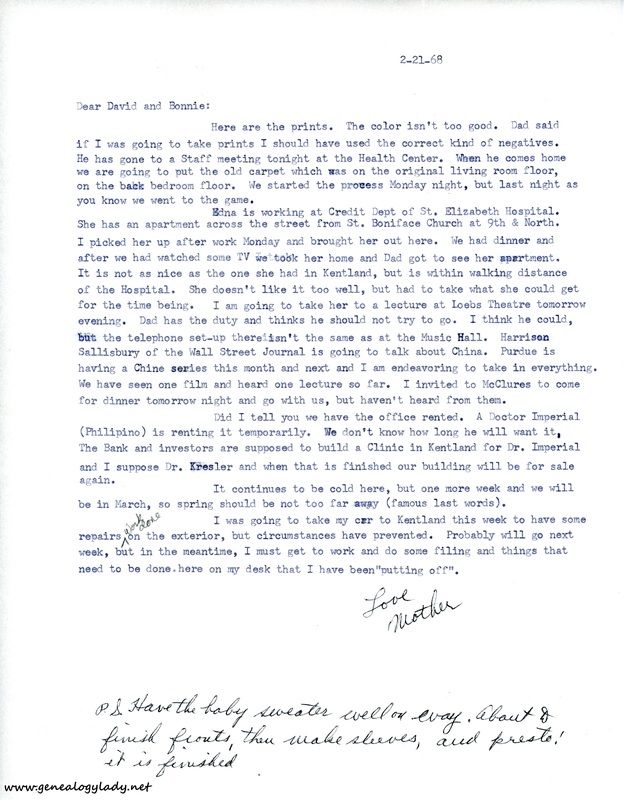 This entry was posted in Genealogy, Yegerlehner and tagged 1960s, David A. Yegerlehner, genealogy, Gladys R. (Foster) Yegerlehner, Indiana, Kentland, Lafayette, Massachusetts, Rockport, Roscoe S. Yegerlehner on April 16, 2017 by Deborah Sweeney. As usual, I’ve forgotten so much. Glad to know that Edna landed.